Inspired by the campaign carried out by the Food and Agriculture Organization (FAO) regarding zero food waste, four students of the Bogor Agricultural Institute (IPB) namely Raisa (Department of Community Nutrition), Lutvi Abdullah (Department of Chemistry), Ahmad Al Banjaran (Department of Computer Science), and Rita Syafitri (Department of Management) created Zwieback of Fish Bone Based on Barcode Novelty Technology (ZITE). ZITE is a cookie with a mixture of ingredients derived from fish bones. The form of fish bones mixed in flexible cookies, not always in the form of powder, but can also take the form of fish bone extract. "The choice of making cookies as a form of food is produced for several reasons. First, cookies are a universal food that many people like. Second, ordinary cookies are used as daily snacks by the community. Third, it's easy to carry anywhere. Fourth, durable," said Raisa. According to him, ZITE has several benefits and uniqueness. The benefit of ZITE is that it can be a solution to reduce fish bone waste and prevent diseases due to calcium deficiency. One of the unique features of ZITE is its packaging. ZITE packaging is equipped with barcode technology that will display ZITE's nutritional content, human nutritional needs per day, and info on production houses. 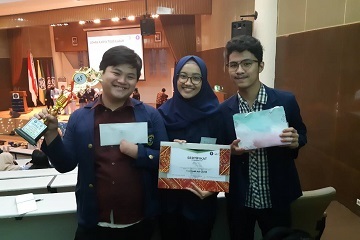 This innovation succeeded in becoming the runner-up in the Innovation Cipta Karya Competition (LKCI) in the Water 201 Future "Water For Future" Competition held by the IPB Water Resources Management Student Association (Himasper) and the Indonesian KIR House at the beginning of November. The event carries the theme "Technology-Based Fisheries and Marine Management Innovations". "Our group is actually four people, but due to limitations in the number of maximum group rules from the competition, it was finally decided by me, Lutvi, and Ahmad who represented the group in the race. Initially, we did not expect to win the championship because we saw a prototype from another group that was no lacking. However, by showing and working on the best we finally won the second place," said Raisa.